I continued browsing inside the jet age hangar. This is a tail fin of the DC-9. Tail number 204 means N3304L, one of the original DC-9s called Series 10, that was delivered in 1965. A head of the prototype Convair 880. Delta was the first airline to put Convair 880 into commercial service, and one of Delta 's 880s became Elvis Presley's private jet "Lisa Marie". And its cockpit. 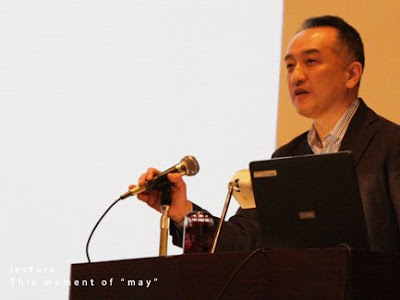 It was a very fast jet, but hard to control and notorious among operators including Japan Airlines. One of engines which accelerated the jet age. A Pratt & Whitney JT3D-3 engine which powered Delta's DC-8-61. I boarded the "Spirit of Delta" through 1L door. The origin of glass cockpit on Boeing's widebody passenger jets. Good old first class seats of America. Not -300, but -200. A real treasure. Viewing the front section of the plane from the main cabin a.k.a. Economy Class. I love boxy overhead bins on the window side and flat ones over the middle rows. I remember Delta's pre-lie-flat 767-300 had these types of bins. Next stop: Jet Age hangar of the museum. 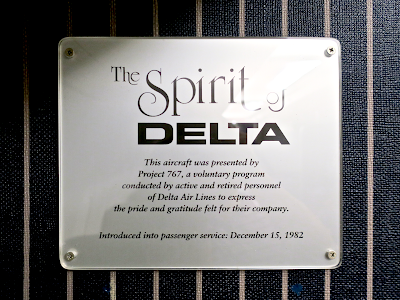 During a challenging time for Delta in the 80s, Delta employees started “Project 767” to raise 30 million USD to buy a brand-new 767-200 as a gift for their company. 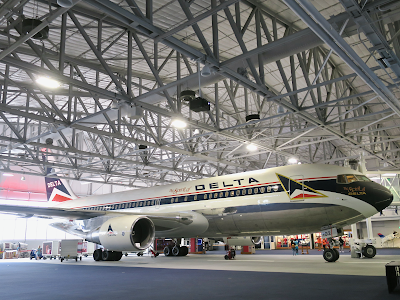 And this is the 767— N102DA, Ship 102, christened the "Spirit of Delta”. 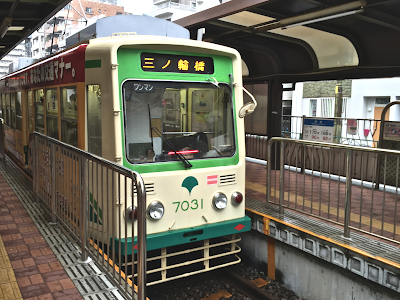 She had been in service for over 23 years, then arrived at the museum after retirement. Delta is known for its non-union culture, and this Boeing jet is a symbol of mutual respect between the company and its employees. I think Delta’s corporate culture focused on people gives them a unique position in the airline industry and ultimately makes flights comfortable for passengers. That's one of the reasons why I keep flying with Delta. 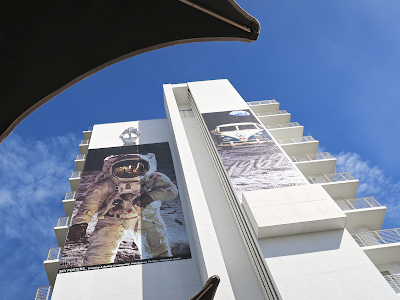 The exhibit starts from Delta's prop era. 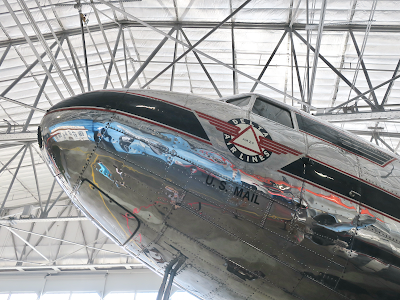 The first plane you see in the hangar is this beautiful DC-3 Ship 41, the first DC-3 to carry Delta passengers. This bird was sold to North Central Airlines which later became part of Northwest Airlines, an airline now called Delta. Curtiss Wright Travel Air 6B Sedan. This restored Travel Air has tail number NC8878—the original number for the plane which flew Delta's first passengers in 1929. Stinson SR-8E Reliant operated by NWA. The airline didn't use this plane for scheduled passenger service but as a trainer. This is the reason why I flew to Atlanta this time. 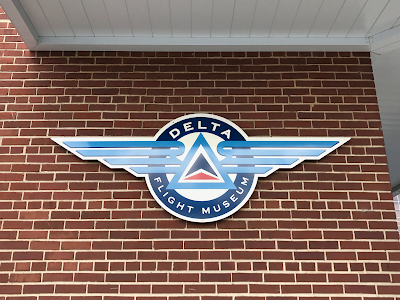 For me, who has been a loyal NWA/Delta flyer since 1991 and was a copywriter for Delta, Delta Flight Museum is the ultimate dream destination. Today, I will spend almost all day here. At the entrance lobby, visitors are welcomed by a cowling of the Rolls-Royce RB211 engine which powered Delta's L-1011 TriStar. 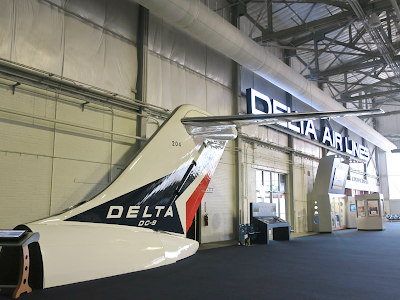 The hangar tells why "airlines" had to be two words at Delta. 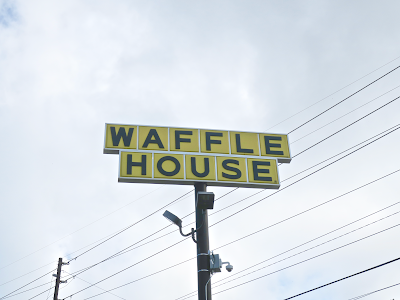 Breakfast at Waffle House. I love their signage with a minimal expression. I love their food and coffee. To me, they are an icon of the South. And I can't leave Georgia without dining at them. Not a glass of iced tea today. Coffee at hotel's comfy bar. 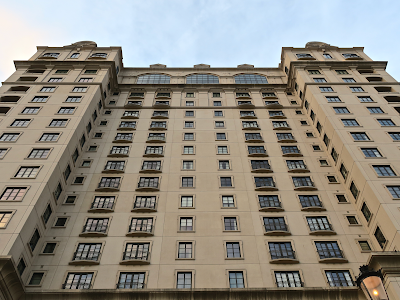 On the outside, the hotel looks a bit fakey. 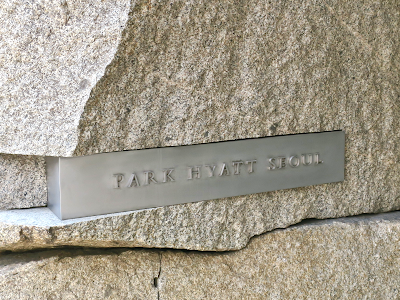 But on the inside, they offer service and hospitality which are appropriate for the brand. At the end of the day, the appearance of the hotel doesn't matter as long as it offers a great experience (except hotels like this). This is my temporary home of the South. 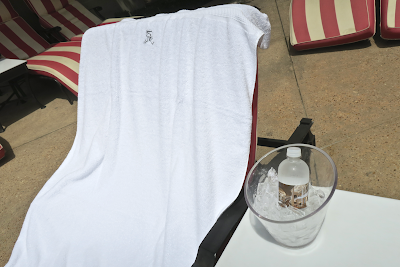 They gave me a spacious suite with a large balcony overlooking hotel's pool area. 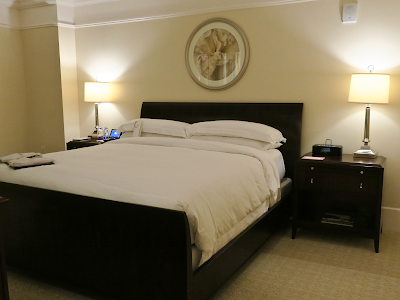 The hotel sits in slightly upscale Buckhead district which has several high-end hotels in the neighborhood. It's a bit far from downtown, but if you drive, no problem. 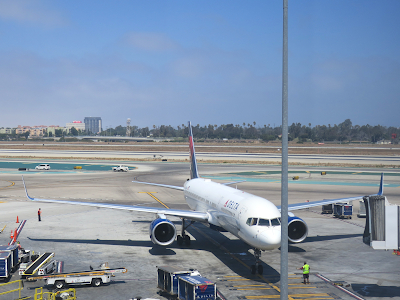 I went through terrible immigration in Tom Bradley International Terminal my flight from Haneda arrived at, rechecked my luggage, and walked to T2 to continue my journey to Atlanta, Delta's home. Today, an ex-NWA 757 takes me to the South. Delta B757-200 LAX-ATL. The 701st flight in my lifetime. Flying to LAX on Delta's 777 with herringbone Delta One seats. Today's ship is N863DA delivered in 1999. Leaving Haneda International Terminal looking at Vietnam's brand-new A350 XWB-900. The design of its blended winglets is quite striking. A hazy LA morning. This flight was my 700th scheduled flight, however it was nothing special and just another comfy Delta flight which arrived on-time as always. 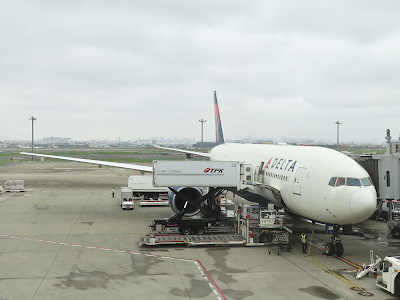 Delta B777-200 HND-LAX. The 700th flight in my lifetime.